Canada's remote communities need reliable and affordable energy to operate their schools and businesses and heat their homes. But the current situation is woefully inadequate. 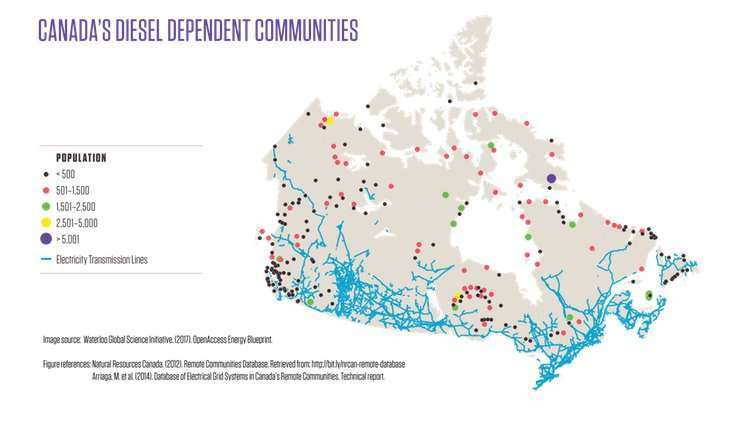 Of the 279 active remote communities not connected to the electric grid, 239 of them rely on diesel fuel for electricity and oil for heating, which must be flown, barged or trucked in. Nearly two thirds of these are Indigenous communities. If the government of Canada removed the barriers and impediments to clean energy development in these rural and remote communities, it would signal a bold commitment to Indigenous peoples and action towards reconciliation. Why? Because rapid deployment of clean energy projects that deliver tangible benefits to a community's well-being are more credible than framework agreements with good intentions with no fixed outcomes. In 2015, the Truth and Reconciliation Commission provided recommendations for change and imbued hope that past injustices and hurt would fade with action. Reconciliation via access to plentiful clean energy is a pathway that has been largely overlooked. Based on our recent work at the Waterloo Global Science Initiative (WGSI), we have seen how communities facing a variety of disadvantages can improve their quality of life when they have better access to energy. A growing body of evidence shows that energy access must not only be reasonably priced and reliable, but it must be of sufficiently high quality and quantity to spur economic growth and social development in communities strangled by energy deficits. Large-scale, rapid improvements to energy access can have positive influences on economic, social, educational and health outcomes. They are an investment in the future that becomes the backbone to support a community's needs and growth. Clean energy projects based on local resources have the most potential to enhance community cohesion and economic well-being, and to move the needle towards reconciliation and trust. Unfortunately, inadequate energy services are the norm in many communities in Nunavut, Ontario and British Columbia. In 25 per cent to 50 per cent of these communities, diesel plants operate close to their maximum capacity during on-peak times, when demand is highest. On the surface, this suggests that these communities can meet their energy needs. But in reality, these constraints translate into a cascade of negative consequences. Without an adequate and reliable supply of energy, communities cannot build new housing and health-care facilities, create businesses or upgrade essential water and sewage treatment plants. One of the challenges to installing clean energy solutions in Indigenous communities lies in the way investments for specific projects are approved. Initiatives often get bogged down in endless discussions about how different levels of government will share the cost and who will be accountable. In addition, the stakeholder consultation process too often fails to arrive at a decision, leaving the community's essential needs unmet. Initiatives are more likely to get to "yes" when Indigenous communities actively participate as "owners" of the solution. Without meaningful community engagement, centrally dispatched initiatives are unlikely to be effective. However, there is room for optimism. The dropping costs of clean energy technologies and recent innovations in distributed energy systems —how energy is taken from and added to the local grid —are helping community-based ownership models emerge. Communities can now choose from several options to find the right power solution for their needs. Low-cost solar cells, run-of-the-river hydropower, wind turbines, geothermal power stations and energy-from-waste facilities can be installed in remote communities. For example, solar cells, which convert sunlight into electricity, are already being used successfully in Behchoko, N.W.T. By combining these technologies with smart devices and sensors, communities can create smart microgrids —small-scale versions of the centralized energy systems that supply electricity to most Canadians. These microgrids, which are not connected to the main grid, can manage a variety of energy-generation sources, and distribute and control the flow of electricity locally. When a community has greater control over energy demand and supply, it can improve energy efficiency, store excess energy, save money and lower greenhouse gas emissions. The first step is for the government of Canada to develop a new accord that affirms the centrality of Indigenous leadership, and then to couple it to economic innovation. Joint partnerships between Indigenous communities and project developers, with the government acting as enabler and mentor to the process, could over time lead to a co-ownership model that has better prospects for success. Establishing such a strategy for Canada's remote Indigenous communities is relatively straightforward. It starts with developing and strengthening the skills of people living in these communities. Governments can also align their policies on land use and environmental impact assessments so that they fully integrate Indigenous communities' values and interests as to how natural resources should be used. Taking these steps would recognize that Indigenous communities must be the ones to decide what constitutes a fair price for energy efficiency and which renewable energy sources are suitable replacements for diesel. We'll also need to see a meaningful investment to spark the transition from fossil fuels to low-carbon energy —from tens of millions of dollars to, perhaps, a billion dollars or more. The 2017 federal budget committed $50 million to help remote communities reduce their dependence on diesel fuel. Given the high cost of even a small hydroelectric project —one in Inukjuak, Quebec was expected to cost about $100 million —the scale and scope of the ambition must be re-visited. None of these recommendations is insurmountable. We can transform the energy systems in Canada's remote communities, but it will require good will and solid connections among people, technology and information. Communities, private businesses and public institutions will need to focus on the end goal and share their knowledge collaboratively. Good will can break a historical logjam of acrimony and distrust between Indigenous and non-Indigenous people in Canada. Why would anyone argue against such an investment? A reliable energy system that meets the needs of those living in the most remote parts of Canada will generate innumerable positive outcomes for community infrastructure, health care, education and economic development —now and for future generations.